Who said candies are only made for kids? Satisfy your sweet tooth with these scrumptious hand-made treats. Looking for something sweet to munch on? These bite-sized candies from Made In Candy are the perfect treats to indulge in to curb your sugar craving. Want to know how they’re made? We caught up with Made In Candy owners Darlene Chua and Arthur Dichaves (sans co-owner Janella Ejercito) to tell us more about their booming business. Launch the gallery to see behind-the-scenes snapshots of the candy-making process, and read our exclusive interview below to learn more about Made In Candy, which launched in October 2012. Made In Candy is located at Powerplant Mall. What’s the story behind Made in Candy? How did you come up with the concept? Darlene: "It actually started when I went to a wedding, and they gave out personalized candies as souvenirs. When I got home, I ate it and it tasted good. I thought that we could do something like this. I checked the wrapper, and found the website, Made in Candy. During that time, Arthur was in Singapore. Made in Candy is a Singaporean brand, so I asked him to check it out and see if it’s reasonable. When he checked it, he liked it also. We started communicating via email with the two owners from Singapore, who are young also. It’s better rapport-wise because we’re all young, so we have the same wavelengths and ideas." Where did the candy makers learn how to make the sweets? You can personalize it, right? How do you do that? Darlene: "It’s hard to explain, but it’s like a 3D puzzle. Let’s say I want the letter 'A.' You visualize it first. All the chefs need to draw prior to working. It’s hard when you make mistakes on the table because you can’t really try to correct it. In baking, you can correct this and add this. With candy-making, you can’t because it hardens, which makes it hard to manipulate. 'Pag nagkamali, you have to throw away the candy—for quality control also. We don’t want mediocre work. We’re kind of perfectionists. " So it’s really like an art? You draw crowds to watch the candy-makers. Darlene: "It’s like a retail experience in the sense that it taps into your senses. You see the candy and how it’s being made. You smell the flavors kasi once we mix in the flavors, it’s hot, and you can smell it. I don’t know if you’ve noticed, but in the malls, it smells like candy. We joke around and say that they should pay us because they don’t have to buy air freshener. Once it’s being made, the chefs hand it out to try, and you can touch it, look at the designs, and then you taste it. That’s when the whole experience comes together. 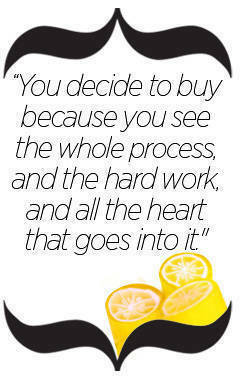 In the end, you wanna buy something not because it’s nice or because you just look at it, but you decide to buy because you see the whole process, and the hard work, and all the heart that goes into it." Since this is new in the country, do you think it’ll start a craze? Darlene: "Number one is mixed berry. Then, watermelon, lychee, strawberry…The lychee comes in a martini glass. We even have guyabano and sour stuff. At first, we were apprehensive because people might not like it, but surprisingly, it’s one of our best sellers." Are they all natural flavors? Darlene: "Yes, that’s why when you taste it, it’s different from other artificially flavored candies." We saw on your Facebook page photos of celebrities eating your candies. Who are some of the celebrities who have purchased from you guys? Darlene: "Jen Mercado. For Christmas, she asked us to customize 'I heart Jen' to give out. Kris Aquino. We also gave out candies to Andi Eigenmann for her daughter. We’re surprised, too, when celebrities pass by. Jericho Rosales and Kim Jones. Edu Manzano passed by also with the kids. " What’s the price range of your candies? Darlene: "We have three different sizes. The 35 gram jar is P50. The foil bags, which are 75 grams each, are P100. We also have the large jar, which is 135 grams, for P260. Sometimes, we make lollipops, which are P70 each. If you want to customize a 6-inch lollipop, that would cost P825. That’s really huge. For customization, it ranges from P8,000 to P11,000." What is the longest you can put in a candy? Darlene: "14 letters max, but that’s around 14 kilos. For a four-kilo weight, 8 letters is the max." Andrew: "We have six chefs, and then we have sales people." 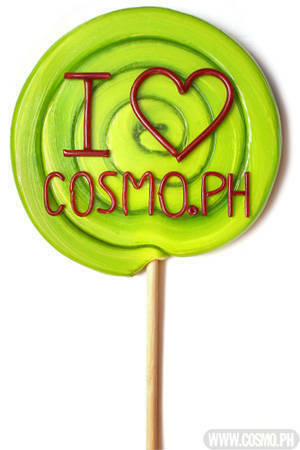 Please “like” us on Facebook, Made in Candy Philippines. Follow us on Instagram and Twitter @MadeincandyPH.